I'm sorry, this item has sold out. 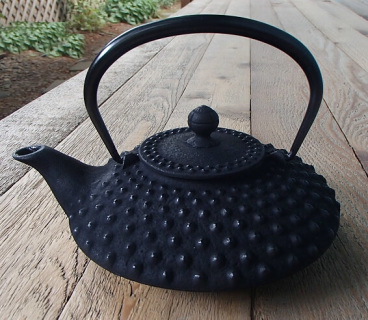 Large, raised 'hailstones' or large hobnails are scattered across this flat-form, all black Japanese cast iron teapot. This Tetsubin includes a fitted fine mesh tea strainer basket and a porcelain enamel coated interior. A great iron anniversary gift! Care instructions will be included with every Tetsubin.